from the BBC programme Desert Island Discs, 29 May 2011. 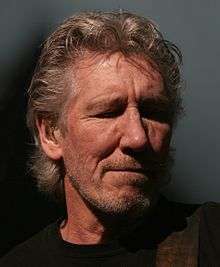 George Roger Waters (born 6 September 1943) is an English singer, songwriter, bassist, and composer. In 1965, he co-founded the progressive rock band Pink Floyd with drummer Nick Mason, keyboardist Rick Wright and guitarist, singer, and songwriter Syd Barrett. Waters initially served as the group's bassist, but following the departure of Barrett in 1968, he also became their lyricist, conceptual leader and co-lead vocalist. Pink Floyd subsequently achieved international success with the concept albums The Dark Side of the Moon, Wish You Were Here, Animals, and The Wall. By the early 1980s, they had become one of the most critically acclaimed and best-selling acts in the history of popular music; as of 2013, they have sold more than 250 million albums worldwide. Amid creative differences within the group, Waters left in 1985 and began a legal dispute with the remaining members over their intended use of the band's name and material. They settled out of court in 1987, and nearly eighteen years passed before he performed with them again. Waters' solo career has included three studio albums: The Pros and Cons of Hitch Hiking, Radio K.A.O.S. and Amused to Death. In 1990, he staged one of the largest and most extravagant rock concerts in history, The Wall – Live in Berlin, with an official attendance of 200,000. As a member of Pink Floyd, he was inducted into the U.S. Rock and Roll Hall of Fame in 1996 and the UK Music Hall of Fame in 2005. That same year he released Ça Ira, an opera in three acts translated from Étienne and Nadine Roda-Gils' libretto about the French Revolution. 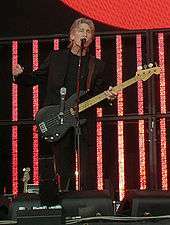 Later that year, he reunited with Pink Floyd bandmates Mason, Wright and David Gilmour for the Live 8 global awareness event; it was the group's first appearance with Waters since 1981. He has toured extensively as a solo act since 1999 and played The Dark Side of the Moon in its entirety for his world tour of 2006–2008. In 2010, he began The Wall Live and in 2011 Gilmour and Mason appeared with him during a performance of the double-album in London. As of 2013, the tour is the highest-grossing of all time by a solo artist. George Roger Waters was born on 6 September 1943, the younger of two boys, to Mary (née Whyte; 1913–2009) and Eric Fletcher Waters (1914–1944), in Great Bookham, Surrey. His father, the son of a coal miner and Labour Party activist, was a schoolteacher, a devout Christian, and a Communist Party member. In the early years of the Second World War, his father was a conscientious objector who drove an ambulance during the Blitz. He later changed his stance on pacifism and joined the British Army, and as a 2Lt. of the 8th Royal Fusiliers died at Aprilia, between Anzio and Rome in Italy, on 18 February 1944, when Roger was five months old. On 19 February 2014, Waters unveiled a monument to his father and other war casualties there, and was made an honorary citizen of Anzio. Following her husband's death, Mary Waters, also a teacher, moved with her two sons to Cambridge and raised them there. Roger Waters' earliest memory is of the VJ Day celebrations. Mary Waters died in 2009, aged 96. Waters attended Morley Memorial Junior School in Cambridge and then the Cambridgeshire High School for Boys (now Hills Road Sixth Form College) with Syd Barrett, while his future musical partner, David Gilmour, lived nearby on the city's Mill Road, and attended the Perse School. At 15, Waters was chairman of the Cambridge Youth Campaign for Nuclear Disarmament (YCND), having designed its publicity poster and participated in its organisation. Though he was a keen sportsman and a highly regarded member of the high school's cricket and rugby teams, he disliked his educational experience; according to Waters, "I hated every second of it, apart from games. The regime at school was a very oppressive one ... the same kids who are susceptible to bullying by other kids are also susceptible to bullying by the teachers." Whereas Waters knew Barrett and Gilmour from his childhood in Cambridge, he met future Pink Floyd founder members Nick Mason and Richard Wright in London at the Regent Street Polytechnic (later the University of Westminster) school of architecture. Waters enrolled there in 1962, after a series of aptitude tests indicated he was well-suited to that field. He had initially considered a career in mechanical engineering. By September 1963, Waters and Mason had lost interest in their studies; they had moved into the lower flat of Stanhope Gardens, owned by Mike Leonard, a part-time tutor at the Regent Street Polytechnic. Waters, Mason and Wright first played music together in late 1963, in a band formed by vocalist Keith Noble and bassist Clive Metcalfe. They usually called themselves Sigma 6, but also used the name the Meggadeaths. Waters played rhythm guitar and Mason played drums, Wright played on any keyboard he could arrange to use, and Noble's sister Sheilagh provided an occasional vocal accompaniment. In the early years the band performed during private functions and rehearsed in a tearoom in the basement of Regent Street Polytechnic. When Metcalfe and Noble left to form their own group in September 1963, the remaining members asked Barrett and guitarist Bob Klose to join. Waters switched to the bass and by January 1964, the group became known as the Abdabs, or the Screaming Abdabs. During late 1964, the band used the names Leonard's Lodgers, Spectrum Five, and eventually, the Tea Set. Sometime during late 1965, the Tea Set began calling itself the Pink Floyd Sound, later the Pink Floyd Blues Band and by early 1966, Pink Floyd. By early 1966 Barrett was Pink Floyd's front-man, guitarist, and songwriter. He wrote or co-wrote all but one track of their debut LP The Piper at the Gates of Dawn, released in August 1967. Waters contributed the song "Take Up Thy Stethoscope and Walk" (his first sole writing credit) to the album. By late 1967, Barrett's deteriorating mental health and increasingly erratic behaviour, rendered him "unable or unwilling" to continue in his capacity as Pink Floyd's singer-songwriter and lead guitarist. In early March 1968 Pink Floyd met with managers Peter Jenner and Andrew King of Blackhill Enterprises to discuss the band's future. Barrett agreed to leave Pink Floyd, and the band "agreed to Blackhill's entitlement in perpetuity" regarding "past activities". The band's new manager Steve O'Rourke made a formal announcement about the departure of Barrett and the arrival of David Gilmour in April 1968. Filling the void left by Barrett's departure in March 1968, Waters began to chart Pink Floyd's artistic direction. He became the principal songwriter, lyricist and co-lead vocalist (along with Gilmour, and at times, Wright), and would remain the band's dominant creative figure until his departure in 1985. He wrote the lyrics to the five Pink Floyd albums preceding his own departure, starting with The Dark Side of the Moon (1973) and ending with The Final Cut (1983), while exerting progressively more creative control over the band and its music. Every Waters studio album since The Dark Side of the Moon has been a concept album. With lyrics written entirely by Waters, The Dark Side of the Moon was one of the most commercially successful rock albums ever. It spent 736 straight weeks on the Billboard 200 chart—until July 1988—and sold over 40 million copies worldwide. It was continuing to sell over 8,000 units every week as of 2005. According to Pink Floyd biographer Glen Povey, Dark Side is the world's second best-selling album, and the United States' 21st best-selling album of all time. Waters produced thematic ideas that became the impetus for the Pink Floyd concept albums The Dark Side of the Moon (1973), Wish You Were Here (1975), Animals (1977) and The Wall (1979)—written largely by Waters—and The Final Cut (1983)—written entirely by Waters. He referred or alluded to the cost of war and the loss of his father throughout his work, from "Corporal Clegg" (A Saucerful of Secrets, 1968) and "Free Four" (Obscured by Clouds, 1972) to "Us and Them" from The Dark Side of the Moon, "When the Tigers Broke Free", first used in the feature film, The Wall (1982), later included with "The Fletcher Memorial Home" on The Final Cut, an album dedicated to his father. The theme and composition of The Wall was influenced by his upbringing in an English society depleted of men after the Second World War. I think things like "Comfortably Numb" were the last embers of mine and Roger's ability to work collaboratively together. The double album The Wall was written almost entirely by Waters and is largely based on his life story, and having sold over 23 million RIAA certified units in the US as of 2013, is one of the top three best-selling albums of all time in America, according to RIAA. Pink Floyd hired Bob Ezrin to co-produce the album, and cartoonist Gerald Scarfe to illustrate the album's sleeve art. The band embarked on The Wall Tour of Los Angeles, New York, London, and Dortmund. 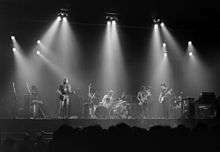 The last band performance of The Wall was on 16 June 1981, at Earls Court London, and this was Pink Floyd's last appearance with Waters until the band's brief reunion at 2 July 2005 Live 8 concert in London's Hyde Park, 24 years later. In March 1983, the last Waters–Gilmour–Mason collaboration, The Final Cut, was released. The album was subtitled: "A requiem for the post-war dream by Roger Waters, performed by Pink Floyd". Waters wrote all the album's lyrics as well as the music. His lyrics were critical of the Conservative Party government of the day and mention Prime Minister Margaret Thatcher by name. 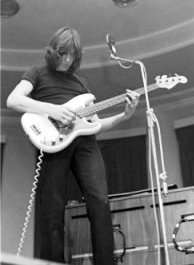 At the time Gilmour did not have any new material, so he asked Waters to delay the recording until he could write some songs, but Waters refused. According to Mason, after power struggles within the band and creative arguments about the album, Gilmour's name "disappeared" from the production credits, though he retained his pay. Rolling Stone magazine gave the album five stars, with Kurt Loder describing it as "a superlative achievement" and "art rock's crowning masterpiece". Loder viewed the work as "essentially a Roger Waters solo album". We eventually formalised a settlement with Roger. On Christmas Eve, 1987, ... David and Roger convened for a summit meeting on the houseboat [the Astoria] with Jerome Walton, David's accountant. Jerome painstakingly typed out the bones of a settlement. Essentially—although there was far more complex detail—the arrangement allowed Roger to be freed from his arrangement with Steve [O'Rourke], and David and me to continue working under the name Pink Floyd. In the end the court accepted Jerome's version as the final and binding document and duly stamped it. Waters was released from his contractual obligation with O'Rourke, and he retained the copyrights to The Wall concept and the inflatable Animals pig. Pink Floyd released three studio albums without Waters: A Momentary Lapse of Reason (1987), The Division Bell (1994) and The Endless River (2014). By 2013, Pink Floyd had sold over 250 million albums worldwide, including 74.5 million RIAA certified units in the US. Following the release of The Final Cut, Waters embarked on a solo career that produced three concept albums and a movie soundtrack. In 1984, he released his first solo album, The Pros and Cons of Hitch Hiking, a project about a man's dreams across one night that dealt with Waters' feelings about monogamy and family life versus "the call of the wild". In the end the character, Reg, chooses love and matrimony over promiscuity. The album featured guitarist Eric Clapton, jazz saxophonist David Sanborn, and artwork by Gerald Scarfe. Kurt Loder described The Pros And Cons of Hitch Hiking as a "strangely static, faintly hideous record". Rolling Stone rated the album a "rock bottom" one star." Years later, Mike DeGagne of AllMusic praised the album for its, "ingenious symbolism" and "brilliant use of stream of consciousness within a subconscious realm", rating it four out of five stars. Waters began touring in support of the new album, aided by Clapton, a new band, new material, and a selection of Pink Floyd favourites. Waters débuted his tour in Stockholm on 16 June 1984. Poor ticket sales plagued the tour, and some of the larger venues had to be cancelled. By his own estimate, he lost £400,000 on the tour. In March 1985, Waters went to North America to play smaller venues with the Pros and Cons Plus Some Old Pink Floyd Stuff—North America Tour 1985. The Pros and Cons of Hitch Hiking has been certified Gold by the RIAA. In 1986, Waters contributed songs and a score to the soundtrack of the animated movie When the Wind Blows, based on the Raymond Briggs book of the same name. His backing band featuring Paul Carrack was credited as The Bleeding Heart Band. In 1987, Waters released Radio K.A.O.S., a concept album based on a mute man named Billy from an impoverished Welsh mining town who has the ability to physically tune into radio waves in his head. Billy first learns to communicate with a radio DJ, and eventually to control the world's computers. Angry at the state of the world in which he lives, he simulates a nuclear attack. Waters followed the release with a supporting tour also in 1987. In November 1989, the Berlin Wall fell, and in July 1990 Waters staged one of the largest and most elaborate rock concerts in history, The Wall – Live in Berlin, on the vacant terrain between Potsdamer Platz and the Brandenburg Gate. The show reported an official attendance of 200,000, though some estimates are as much as twice that, with approximately one billion television viewers. Leonard Cheshire asked him to do the concert to raise funds for charity. Waters' group of musicians included Joni Mitchell, Van Morrison, Cyndi Lauper, Bryan Adams, Scorpions, and Sinéad O'Connor. Waters also used an East German symphony orchestra and choir, a Soviet marching band, and a pair of helicopters from the US 7th Airborne Command and Control Squadron. 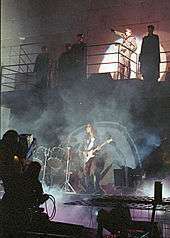 Designed by Mark Fisher, the Wall was 25 metres tall and 170 metres long and was built across the set. Scarfe's inflatable puppets were recreated on an enlarged scale, and although many rock icons received invitations to the show, Gilmour, Mason, and Wright, did not. Waters released a concert double album of the performance which has been certified platinum by the RIAA. In 1990, Waters hired manager Mark Fenwick and left EMI for a worldwide deal with Columbia. He released his third studio album, Amused to Death, in 1992. The record is heavily influenced by the events of the Tiananmen Square protests of 1989 and the Gulf War, and a critique of the notion of war becoming the subject of entertainment, particularly on television. The title was derived from the book Amusing Ourselves to Death by Neil Postman. Patrick Leonard, who worked on A Momentary Lapse of Reason, co-produced the album. Jeff Beck played lead guitar on many of the album's tracks, which were recorded with an impressive cast of musicians at ten different recording studios. It is Waters' most critically acclaimed solo recording, garnering some comparison to his previous work with Pink Floyd. Waters described the record as, a "stunning piece of work", ranking the album with Dark Side of the Moon and The Wall as one of the best of his career. The album had one hit, the song "What God Wants, Pt. 1", which reached number 35 in the UK in September 1992 and number 5 on Billboard's Mainstream Rock Tracks chart in the US. Amused to Death was certified Silver by the British Phonographic Industry. Sales of Amused to Death topped out at around one million and there was no tour in support of the album. Waters would first perform material from it seven years later during his In the Flesh tour. In 1996, Waters was inducted into the US and UK Rock and Roll Halls of Fame as a member of Pink Floyd. In 1999, after a 12-year hiatus from touring, and a seven-year absence from the music industry, Waters embarked on the In the Flesh tour, performing both solo and Pink Floyd material. The tour was a financial success in the US and though Waters had booked mostly smaller venues, tickets sold so well that many of the concerts were upgraded to larger ones. The tour eventually stretched across the world and would span three years. A concert film was released on CD and DVD, named In the Flesh – Live. During the tour, he played two new songs "Flickering Flame" and "Each Small Candle" as the final encore to many of the shows. In June 2002, he completed the tour with a performance in front of 70,000 people at the Glastonbury Festival of Performing Arts, playing 15 Pink Floyd songs and five songs from his solo catalogue. Miramax announced in mid-2004 that a production of The Wall was to appear on Broadway with Waters playing a prominent role in the creative direction. Reports stated that the musical contained not only the original tracks from The Wall, but also songs from Dark Side of the Moon, Wish You Were Here and other Pink Floyd albums, as well as new material. On the night of 1 May 2004, recorded extracts from the opera, including its overture, were played on the occasion of the Welcome Europe celebrations in the accession country of Malta. Gert Hof mixed recorded excerpts from the opera into a continuous piece of music which was played as an accompaniment to a large light and fireworks display over Grand Harbour in Valletta. In July 2004, Waters released two new tracks on the Internet: "To Kill the Child", inspired by the 2003 invasion of Iraq, and "Leaving Beirut", an anti-war song "inspired by his travels in the Middle East as a teenager". In July 2005, Waters reunited with Mason, Wright, and Gilmour for what would be their final performance together at the 2005 Live 8 concert in London's Hyde Park, Pink Floyd's only appearance with Waters since their final performance of The Wall at Earls Court London 24 years earlier. They played a 23-minute set consisting of "Speak to Me/Breathe"/"Breathe (Reprise)", "Money", "Wish You Were Here", and "Comfortably Numb". Waters told the Associated Press that while the experience of playing with Pink Floyd again was positive, the chances of a bona fide reunion would be "slight" considering his and Gilmour's continuing musical and ideological differences. Though Waters had differing ideas about which songs they should play, he "agreed to roll over for one night only", Gilmour told the Associated Press, "The rehearsals convinced me it wasn't something I wanted to be doing a lot of. There have been all sorts of farewell moments in people's lives and careers which they have then rescinded, but I think I can fairly categorically say that there won't be a tour or an album again that I take part in. It isn't to do with animosity or anything like that. It's just that ... I've been there, I've done it." In November 2005, Pink Floyd were inducted into the UK Music Hall of Fame by Pete Townshend of the Who. In September 2005, Waters released Ça Ira (pronounced [sa iˈʁa], French for "it will be fine"; Waters added the subtitle, "There is Hope"), an opera in three acts translated from the late Étienne Roda-Gil's French libretto based on the historical subject of the French Revolution. Ça Ira was released as a double CD album, featuring baritone Bryn Terfel, soprano Ying Huang and tenor Paul Groves. Set during the early French Revolution, the original libretto was co-written in French by Roda-Gil and his wife Nadine Delahaye. Waters had begun rewriting the libretto in English in 1989, and said about the composition: "I've always been a big fan of Beethoven's choral music, Berlioz and Borodin ... This is unashamedly romantic and resides in that early 19th-century tradition, because that's where my tastes lie in classical and choral music." Waters appeared on television to discuss the opera, but the interviews often focused instead on his relationship with Pink Floyd, something Waters would "take in stride", a sign Pink Floyd biographer Mark Blake believes to be, "a testament to his mellower old age or twenty years of dedicated psychotherapy". Ça Ira reached number 5 on the Billboard Classical Music Chart in the United States. In June 2006, Waters commenced The Dark Side of the Moon Live tour, a two-year, world-spanning effort that began in Europe in June and North America in September. The first half of the show featured both Pink Floyd songs and Waters' solo material, while the second half included a complete live performance of the 1973 Pink Floyd album The Dark Side of the Moon, the first time in over three decades that Waters had performed the album. The shows ended with an encore from the third side of The Wall. He utilised elaborate staging by concert lighting designer Marc Brickman complete with laser lights, fog machines, pyrotechnics, psychedelic projections, and inflatable floating puppets (Spaceman and Pig) controlled by a "handler" dressed as a butcher, and a full 360-degree quadraphonic sound system was used. Nick Mason joined Waters for The Dark Side of the Moon set and the encores on select 2006 tour dates. Waters continued touring in January 2007 in Australia and New Zealand, then Asia, Europe, South America, and back to North America in June. In March 2007, the Waters song, "Hello (I Love You)" was featured in the science fiction film The Last Mimzy. The song plays over the film's end credits. He released it as a single, on CD and via download, and described it as, "a song that captures the themes of the movie, the clash between humanity's best and worst instincts, and how a child's innocence can win the day". He performed at California's Coachella Festival in April 2008 and was to be among the headlining artists performing at Live Earth 2008 in Mumbai, India in December 2008, but that concert was cancelled in light of the 26 November terrorist attacks in Mumbai. In April 2008, Waters confirmed the possibility of an upcoming solo album which "might be called" Heartland, and has said he has numerous songs written (some already recorded) that he intends to release when they are a complete album. In June 2010, Waters released a cover of "We Shall Overcome", a protest song rewritten and arranged by Guy Carawan and Pete Seeger. He performed with David Gilmour at the Hoping Foundation Benefit Evening in July 2010. The four-song set included: "To Know Him Is to Love Him", which was played in early Pink Floyd sound checks, followed by "Wish You Were Here", "Comfortably Numb", and "Another Brick in the Wall (Part Two)". In September 2010, Waters commenced The Wall Live tour, an updated version of the original Pink Floyd shows, featuring a complete performance of The Wall. Waters told the Associated Press that The Wall Tour will likely be his last, stating: "I'm not as young as I used to be. I'm not like B.B. King, or Muddy Waters. I'm not a great vocalist or a great instrumentalist or whatever, but I still have the fire in my belly, and I have something to say. I have a swan song in me and I think this will probably be it." At The O2 Arena in London on 12 May 2011, Gilmour and Mason once again appeared with Waters and Gilmour performing "Comfortably Numb", and Gilmour and Mason joining Waters for "Outside the Wall". For the first half of 2012, Waters' tour topped worldwide concert ticket sales having sold more than 1.4 million tickets globally. As of 2013, The Wall Live is the highest-grossing tour of all time by a solo artist. Waters performed at the Concert for Sandy Relief at Madison Square Garden on 12 December 2012. On 24 July 2015, Waters headlined the Newport Folk Festival in Newport, Rhode Island. Waters was accompanied by the band My Morning Jacket and two singers from the group Lucius. On 3 May 2016, Waters was announced as one of the headline performers at the Desert Trip music festival and performed twice on 9 and 16 October 2016. In mid October 2016, Waters announced that he would return to North America in 2017 with a pioneering new tour named "Us + Them", stating: "We are going to take a new show on the road, the content is very secret. It'll be a mixture of stuff from my long career, stuff from my years with Pink Floyd, some new things. Probably 75% of it will be old material and 25% will be new, but it will be all connected by a general theme. It will be a cool show, I promise you. It'll be spectacular like all my shows have been." It is intended that the 44-date Us + Them Tour would visit the United States and Canada, showcase Waters' highlights, start on 26 May 2017 in Kansas City, MO and end on 28 October 2017 in Vancouver, BC. The tour title is derived from the track "Us and Them," from the 1973 Pink Floyd album The Dark Side of the Moon. In 1969, Waters married his childhood sweetheart Judy Trim, a successful potter; she was featured on the gatefold sleeve of the original release of Ummagumma, but excised from subsequent CD reissues. They had no children together and divorced in 1975. Trim died in 2001. In 1976, Waters married Lady Carolyne Christie, the niece of the 3rd Marquess of Zetland. His marriage to Christie produced a son, Harry Waters, a musician who has played keyboards with his father's touring band since 2006, and a daughter, India Waters, who has worked as a model. Christie and Waters divorced in 1992. In 1993, he married Priscilla Phillips; they had one son together, Jack Fletcher. Their marriage ended in 2001. In 2004, Waters became engaged to actress and filmmaker Laurie Durning (born 1963); the two married on 14 January 2012 and filed for divorce in September 2015. After the 2004 Indian Ocean earthquake and subsequent tsunami disaster, Waters performed "Wish You Were Here" with Eric Clapton during a benefit concert on the American network NBC. He was outspoken against the Hunting Act of 2004, and performed a concert for, and attended marches supporting, the Countryside Alliance. Waters explained that whether he supported hunting or not, it was important to defend it as a right. He left the UK soon afterwards. He clarified in October 2005 that he had not left the country in protest against the hunting legislation but for family reasons, and that he often returned to the UK. The loss of a father is the central prop on which [The Wall] stands. As the years go by, children lose their fathers again and again, for nothing. You see it now with all these fathers, good men and true, who lost their lives and limbs in Iraq for no reason at all. I've done "Bring The Boys Back Home" in my encore on recent tours. It feels more relevant and poignant to be singing that song now than it did in 1979. In 2012, Waters led a benefit for United States military veterans called Stand Up for Heroes. He invited a music group of combat wounded veterans called MusiCorps to perform with him. In June 2013, Waters and numerous other celebrities appeared in a video showing support for Chelsea Manning. In June 2009 he spoke against the Israeli West Bank barrier and later that year, pledged his support to the Gaza Freedom March. In 2011 he announced that he had joined the Boycott, Divestment and Sanctions (BDS) movement against Israel. He has said he is disillusioned with UK foreign policy towards Israel. In October 2010, after an animated B-52 bomber had been shown dropping symbols including the Star of David and dollar signs as part of The Wall Live tour, the Anti-Defamation League (ADL) criticised the imagery and claimed it was anti-Semitic. In response, Waters changed the video and wrote an open letter to The Independent where he denied he was anti-Semitic and claimed he was only criticizing Israel. In March 2013, during an interview with Electronic Intifada, Waters criticised American media for their coverage of Israel. For many years, Pink Floyd concerts and Waters concerts have used a pig-shaped balloon painted with political and religious symbols flown overhead during shows while he performs in fascist uniform. In July 2013, the Israeli media complained about the symbolism. In October 2016 Waters lost four million dollars in sponsorship after American Express refused to fund his North America tour due to his anti-Israel rhetoric at a previous festival sponsored by the financial company. In November 2016 Citibank joined American Express in cutting ties to Waters. "Citi is not a sponsor of Roger Waters' upcoming tour," a Citibank official said, noting that the company had "offered a limited time pre-sale of tickets for cardmembers for select shows. ... The pre-sale has ended and we have no plans to work with [Waters] in the future." The ADL's National Director Abraham H. Foxman has accused him of anti-Semitism as has Rabbi Abraham Cooper, associate dean of the Simon Wiesenthal Center. Waters stated that Cooper's accusation was bigoted. On 2 October 2015, Waters published an open letter in Salon criticising the band Bon Jovi for performing in Tel Aviv, which led Howard Stern to criticise Waters on his radio show. Waters' primary instrument in Pink Floyd was the electric bass guitar. He briefly played a Höfner bass but replaced it with a Rickenbacker RM-1999/4001S, until 1970 when it was stolen along with the rest of the band's equipment in New Orleans. He began using Fender Precision Basses in 1968, originally alongside the Rickenbacker 4001, and then exclusively after the Rickenbacker was lost in 1970. First seen at a concert in Hyde Park, London in July 1970, the black P-Bass was rarely used until April 1972 when it became his main stage guitar and as of 2 October 2010, the basis for a Fender Artist Signature model. Waters endorses RotoSound Jazz Bass 77 flat-wound strings. Throughout his career he has used Selmer, WEM, Hiwatt and Ashdown amplifiers but has used Ampeg for the last few tours, also employing delay, tremolo, chorus, stereo panning and phaser effects in his bass playing. Waters experimented with the EMS Synthi A and VCS 3 synthesisers on Pink Floyd pieces such as "On the Run", "Welcome to the Machine", and "In the Flesh?" He played electric and acoustic guitar on Pink Floyd tracks using Fender, Martin, Ovation and Washburn guitars. He played electric guitar on the Pink Floyd song "Sheep", from Animals, and acoustic guitar on several Pink Floyd recordings, such as "Pigs on the Wing 1 & 2", also from Animals, "Southampton Dock" from The Final Cut, and on "Mother" from The Wall. A Binson Echorec 2 echo effect was used on his bass-guitar lead track "One of These Days". Waters plays trumpet during concert performances of "Outside the Wall". According to vintagevinylnews.com, Waters had the 9th widest vocal range on a list of over 150 singers, with a total range of B1-C7. ↑ "Roger Waters". Desert Island Discs. 29 May 2011. BBC Radio 4. Retrieved 18 January 2014. ↑ Thompson 2013, p. 7. 1 2 Blake 2008, p. 13. ↑ Blake 2008, pp. 13–14; for the Commonwealth War Graves Commission entry on Eric Waters see: "Casualty Details". Commonwealth War Graves Commission. Retrieved 1 March 2013. ↑ Manning 2006, pp. 5–6. ↑ "Desert Island Discs, Roger Waters". BBC Radio 4. 29 May 2011. Retrieved 29 May 2011. ↑ Watkinson & Anderson 1991, pp. 15–18. ↑ Mason 2005, pp. 12–13. 1 2 Povey 2008, p. 13. ↑ Watkinson & Anderson 1991, p. 23. ↑ Blake 2008, pp. 14–19. ↑ Povey 2008, p. 320. ↑ Blake 2008, p. 36. ↑ Blake 2008, p. 40: (secondary source); Mason 2005, p. 20: (primary source). ↑ Manning 2006, p. 13: (secondary source); Mason 2005, p. 17: (primary source). ↑ Mason 2005, pp. 17–18. ↑ Mason 2005, pp. 13–18. ↑ Mason 2005, p. 18: (primary source); Povey 2008, p. 14: (secondary source). 1 2 Povey 2008, p. 14. ↑ Povey 2008, pp. 18, 28. ↑ Mason 2005, pp. 30–37: (primary source); Povey 2008, p. 32: (secondary source). ↑ Mason 2005, p. 87. 1 2 Mason 2005, pp. 87–107. ↑ Blake 2008, p. 91. ↑ Blake 2008, pp. 90–114. ↑ Mason 2005, p. 129. ↑ Mason 2005, p. 105. ↑ Mason 2005, p. 106. ↑ Mason 2005, pp. 106–107, 160–161, 265, 278. ↑ Blake 2008, pp. 3, 9, 113, 156, 242, 279, 320, 398. ↑ Titus, Christa; Waddell, Ray (2005). "Floyd's 'Dark Side' Celebrates Chart Milestone". Billboard. Retrieved 24 October 2011. ↑ Povey 2008, p. 345. ↑ Mason 2005, pp. 265–269. ↑ Blake 2008, p. 294. ↑ Blake 2008, pp. 294–295, 351. ↑ Blake 2008, p. 275. ↑ Blake 2008, p. 260. ↑ "RIAA GOLD & PLATINUM Top 100 Albums". Recording Industry Association of America. Retrieved 17 October 2010. ↑ Blake 2008, pp. 260–261. ↑ Povey & Russell 1997, p. 185. ↑ Povey 2008, p. 230. ↑ Blake 2008, pp. 294–299. ↑ Blake 2008, p. 295. ↑ Mason 2005, pp. 264–270. ↑ Blake 2008, p. 300: "art rock's crowning masterpiece"; Schaffner 1991, p. 262: "a superlative achievement". ↑ Loder, Kurt (14 April 1983). "Pink Floyd: The Final Cut (Toshiba)". Rolling Stone. Retrieved 6 May 2012. 1 2 Povey 2008, pp. 240–241. ↑ Povey 2008, pp. 221, 237, 240–241, 246. ↑ Blake 2008, pp. 312–313. ↑ Mason 2005, pp. 293–294. ↑ Manning 2006, pp. 139. ↑ For Pink Floyd's worldwide album sales see: "Pink Floyd Reunion Tops Fans' Wish List in Music Choice Survey". Bloomberg. 26 September 2007. Retrieved 25 May 2012. ; "Pink Floyd's a dream, Zeppelin's a reality". Richmond Times-Dispatch. 28 September 2007. Retrieved 25 May 2012. ; "Pink Floyd biography". Official site. Retrieved 4 June 2012. ; for Pink Floyd's US album sales see: "Top Selling Artists". Recording Industry Association of America. Retrieved 17 October 2010. 1 2 3 Schaffner 1991, pp. 272–273. ↑ Blake 2008, pp. 305–306. ↑ DeGagne, Mike. "The Pros and Cons of Hitch Hiking". AllMusic. Retrieved 17 October 2010. ↑ Blake 2008, pp. 332–333. ↑ Blake 2008, p. 309. 1 2 "RIAA Certifications". Recording Industry Association of America. Retrieved 17 November 2010. ↑ Fitch 2005, p. 36. ↑ Manning 2006, p. 131. ↑ Povey & Russell 1997, pp. 246–247. ↑ Blake 2008, p. 346. ↑ Blake 2008, pp. 342–347. ↑ Blake 2008, pp. 348–349. ↑ Blake 2008, pp. 347–352. ↑ Manning 2006, pp. 141, 252. ↑ "Roger Waters: Billboard Singles". AllMusic. Retrieved 20 November 2010. ↑ "BPI Certifications". British Phonographic Industry. Retrieved 2 October 2010. ↑ Povey 2008, pp. 323–324. ↑ "Rock & Roll Hall of Fame Pink Floyd". Rock & Roll Hall of Fame. Retrieved 2 October 2010. 1 2 Povey 2008, pp. 329–334. ↑ "Pink Floyd's Wall Broadway bound". BBC News. 5 August 2004. Retrieved 2 October 2010. ↑ Povey 2008, p. 334. 1 2 Blake 2008, p. 391. ↑ Povey 2008, pp. 237, 266–267. ↑ Schaffner 1991, p. 308. ↑ Blake 2008, pp. 382–383. ↑ "Gilmour says no Pink Floyd reunion". MSNBC. 9 September 2008. Retrieved 6 October 2010. ↑ Tsioulcas, Anastasia (27 August 2005). "Waters' New Concept". Billboard. p. 45. Retrieved 6 May 2012. ↑ Povey 2008, pp. 324–325. ↑ Manning 2006, p. 256. 1 2 Blake 2008, p. 392. ↑ "Roger Waters: Ca Ira". Billboard. Retrieved 17 February 2013. ↑ Povey 2008, pp. 319, 334–338. ↑ "Reminder – Pink Floyd Rock Icon Roger Waters Records "Hello (I Love You)", an Original Song for New Line Cinema's "The Last Mimzy"". Marketwire. January 2007. Retrieved 29 June 2015. ↑ "Pink Floyd's Roger Waters to join Bon Jovi at Live Earth India". NME. 21 November 2008. Retrieved 2 October 2010. ↑ Michaels, Sean (1 December 2008). "Live Earth India cancelled after Mumbai attacks". The Guardian. London. Retrieved 18 October 2010. ↑ Brown, Mark (25 April 2008). "Read the complete Roger Waters interview". Rocky Mountain News. Retrieved 17 October 2010. ↑ Youngs, Ian (15 October 2010). "Pink Floyd may get back together for charity". BBC News. Retrieved 19 October 2010. ↑ Kreps, David (12 July 2010). "Pink Floyd's Gilmour and Waters Stun Crowd With Surprise Reunion". Rolling Stone. Retrieved 30 May 2011. ↑ Jones, Rebecca (27 May 2010). "Pink Floyd's Roger Waters revisits The Wall". BBC News. Retrieved 19 October 2010. ↑ Butler, Will (12 April 2010). "Roger Waters Revisits 'The Wall' For Final Anniversary Tour". NPR. Retrieved 26 November 2010. ↑ "Pink Floyd bandmates reunite at Roger Waters concert". viagogo. 16 May 2011. Retrieved 16 May 2011. ↑ Allen, Bob (4 October 2013). "Roger Waters Passes Madonna for Solo Boxscore Record with $459M Wall Live Tour". Billboard.biz. Retrieved 5 October 2013. ↑ "12 Unforgettable Photos from the Epic 12–12–12 Sandy Benefit Concert". Time. 13 December 2012. Retrieved 15 December 2012. ↑ Kreps, Daniel (25 July 2015). "Watch Roger Waters Perform With My Morning Jacket at Newport Folk Fest". Rolling Stone. Retrieved 27 July 2015. ↑ Grow, Kory (3 May 2016). "Stones, McCartney, Dylan, the Who, Waters, Young Confirm Mega-Fest". Rolling Stone. Retrieved 4 May 2016. ↑ "Roger Waters – Us + Them". roger-waters.com. October 2016. Retrieved 24 October 2016. ↑ Mabbett 2010, p. 50. 1 2 3 Fitch 2005, p. 335. ↑ Blake 2008, p. 376. ↑ Blake 2008, p. 258: India Waters; Povey 2008, pp. 335–339: Harry has performed with Waters since 2006. ↑ Blake 2008, p. 348; Thompson 2013, p. 109: Jack Fletcher. ↑ Marsh, Julia (2015-12-18). "Roger Waters' estranged wife just wants her Rolex back". Page Six. Retrieved 2016-03-14. ↑ "Pink Floyd's Roger Waters marries for a fourth time". NME. 21 January 2013. Retrieved 2013-09-06. ↑ "Pink Floyd's Roger Waters Files for Divorce from Wife Laurie Durning". Closer Weekly. 28 September 2015. Retrieved 2015-10-08. ↑ "Please, God - I'm an atheist so maybe I shouldn't be asking God - but let Barack Obama finally win the Democratic nomination and elect a person who seems to be not just enormously intelligent but also deeply humane and seems to have an imagination." Roger Waters interviewed by Mark Brown. Rocky Mountain Music, April 25, 2008. Retrieved on 2008-06-10 from http://blogs.rockymountainnews.com/rocky_mountain_music/2008/04/read_the_complete_roger_waters.html. ↑ "Stars lend a hand for tsunami relief". MSNBC. Retrieved 2 October 2010. ↑ "Roger Waters: French Revolution". The Independent. 4 October 2005. Archived from the original on 5 October 2010. Retrieved 29 May 2014. ↑ Blake 2008, pp. 391–392. ↑ Waters, Roger (11 June 2007). "Waters: Something can be done about extreme poverty". CNN. Retrieved 18 October 2010. ↑ Fricke 2009, p. 74. ↑ Carucci, John (9 November 2012). "Roger Waters & Veterans Perform Together At Stand Up for Heroes Benefit". Huffington Post. Retrieved 19 May 2013. ↑ Gavin, Patrick (19 June 2013). "Celeb video: 'I am Bradley Manning'". Politico. ↑ Thil, Scott (2 June 2009). "Roger Waters to Israel: Tear Down the Wall". Wired News. Retrieved 14 October 2010. ↑ For Waters' support of the BDS movement see: "Roger Waters voices support for Israel boycott". Haaretz. 6 March 2011. Retrieved 6 March 2011. ; For Waters' support of the Gaza Freedom March see: Goodman, Amy (30 December 2009). "EXCLUSIVE...Pink Floyd's Roger Waters Speaks Out in Support of Gaza Freedom March, Blasts Israeli-Egyptian "Siege" of Gaza". Democracy Now!. Retrieved 3 March 2012. ↑ Cronin, David (18 March 2013). "Boycotting Israel is the "way to go," says Pink Floyd legend Roger Waters". ElectronicIntifada. Retrieved 19 March 2013. ↑ Andy Greene (7 October 2010). "Roger Waters Changes Controversial 'Wall' Video". Rolling Stone. Retrieved 19 October 2015. ↑ Harkov, Lahav (5 October 2010). "Roger Waters: I'm not anti-Semitic, I'm anti-occupation". The Jerusalem Post. ↑ Chumley, Cheryl (5 April 2013). "Pink Floyd's Roger Waters, who is pro-Palestinian, abruptly cancels Jewish stop". The Washington Times. ↑ Cubarrubia, RJ (2 August 2013). "Roger Waters Addresses Star of David Controversy". Rolling Stone. ↑ "Roger Waters concert features Nazi-like uniform, pig balloon with Jewish symbol". Haaretz. 25 July 2013. ↑ "Roger Waters concert features Nazi-like uniform, pig balloon with Jewish symbol". The Jerusalem Post. 25 July 2013. ↑ "Roger Waters Loses $4 Million Sponsorship Over 'anti-Israel Rhetoric'". Haaretz. 30 October 2016. ↑ "Wish You Weren't Here: Citibank Joins American Express in Cutting Ties to Roger Waters". The Tower. ↑ "ADL sadly concludes that Roger Waters is an anti-Semite". The Times of Israel. Retrieved 2015-10-31. ↑ "ADL Open Letter to Roger Waters". ADL. 22 August 2013. Retrieved 18 October 2015. ↑ "Wiesenthal Center: By Floating a Pig Balloon Stamped With Star of David at His Concert, Roger Waters Has Moved to the Front of the Line of Anti-Semites". The Simon Wiesenthal Center. 24 July 2013. ↑ "Pig Balloon at Roger Waters Concert Features Star of David; Wiesenthal Center Calls Him 'Open Hater of Jews' (VIDEO)". Algemeiner.com. Retrieved 2015-10-31. ↑ Thorpe, Vanessa; York, Edward Helmore in New. "Former Pink Floyd frontman sparks fury by comparing Israelis to Nazis". the Guardian. Retrieved 2015-10-31. ↑ Waters, Roger. "Roger Waters to Jon Bon Jovi: "You stand shoulder to shoulder with the settler who burned the baby"". Retrieved 2015-10-31. ↑ Silman, Anna. ""What is it you want, f**khead? ": Howard Stern rants over Roger Waters' letter to Bon Jovi on Salon". Retrieved 2015-10-31. ↑ "Roger Waters Precision Bass". Fender Musical Instruments Corporation. Retrieved 9 October 2010. ↑ "Rotosound Endorsees". Rotosound. Retrieved 23 November 2010. 1 2 Fitch 2005, pp. 416–430, 441–445. ↑ Mason 2005, p. 169. ↑ Fitch 2005, p. 324. ↑ Fitch & Mahon 2006, p. 71. ↑ Fitch 2005, p. 285. ↑ Fitch 2005, pp. 241–242. ↑ Fitch 2005, p. 295. ↑ Fitch 2005, p. 213. ↑ Mabbett 1995, p. 39. ↑ Fitch 2005, p. 232. ↑ "Mike Patton Actually Has the Biggest Vocal Range in Pop Music". SPIN. 2014-05-27. Retrieved 2016-03-14. Fricke, David (December 2009). "Roger Waters: Welcome to My Nightmare ... Behind The Wall". Mojo. Emap Metro. 193: 68–84. Thompson, Dave (2013). 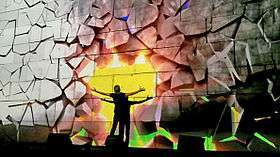 Roger Waters: The Man Behind The Wall. Backbeat Books. ISBN 978-1-61713-564-4. Watkinson, Mike; Anderson, Pete (1991). Crazy Diamond: Syd Barrett & the Dawn of Pink Floyd (1st UK paperback ed.). Omnibus Press. ISBN 978-1-84609-739-3. Harris, John (2005). The Dark Side of the Moon: The Making of the Pink Floyd Masterpiece. Da Capo. ISBN 978-0-306-81342-9. Hiatt, Brian (September 2010). "Back to The Wall". Rolling Stone. Vol. 1114. pp. 50–57. MacDonald, Bruno (1997). Pink Floyd: through the eyes of ... the band, its fans, friends, and foes. Da Capo Press. ISBN 978-0-306-80780-0. Mabbett, Andy; Mabbett, Miles (1994). Pink Floyd : the visual documentary. Omnibus Press. ISBN 978-0-7119-1444-5. Miles, Barry (1982). Pink Floyd: A Visual Documentary by Miles. New York: Putnam Publishing Group. ISBN 978-0-399-41001-7. Simmons, Sylvie (December 1999). "Pink Floyd: The Making of The Wall". Mojo. London: Emap Metro. 73: 76–95.